I was thrilled to come across the conical pits of Antlions (Myrmeleon immaculatus) yesterday; the handiwork of one of my favorite insects. I had become concerned that above average rainfall this season had drowned-out a robust year for these fascinating predators. However, the localized population in the home landscaping I visited appeared to be very healthy with pits in several locations. Antlions belong to the insect order Neuroptera (neuro = nerve, optera = wing). Adults have long, thin bodies that measure around 1" in length. They fly at night, so they are a rare find during the day. There are several species of antlions. The genus, Myrmeleon, is based on the predatory behavior of the larval stage of some species and is derived from Latin for ant (mymex) and lion (leon). The genus, Dendroleon, is based on the location of the larval pits of other species which are commonly found in loose soil around the base of mature trees. Females insert their eggs into dry, powdery soil, or sandy soil. Favored locations include loose soil near building foundations or around the base of trees. Once the eggs hatch, the true "antlion" portion of the life cycle appears on the scene. The grayish-brown, slightly hairy larvae are heavily plated, almost armor-like, and they sport impressive out-sized, sickle-shaped mandibles; necessary equipment for a predator. The antlions excavate their pit-fall traps by moving backwards in the loose soil in a spiral pattern and using their mandibles like tiny shovels to flip away soil. Eventually, a funnel-shaped pit, measuring around 3/4 - 2" wide and 1/2" deep is created with the antlion buried at the bottom; only their wicked looking mandibles are exposed. If you pull an antlion larva from the soil, they will immediately try to cover themselves back up with soil! 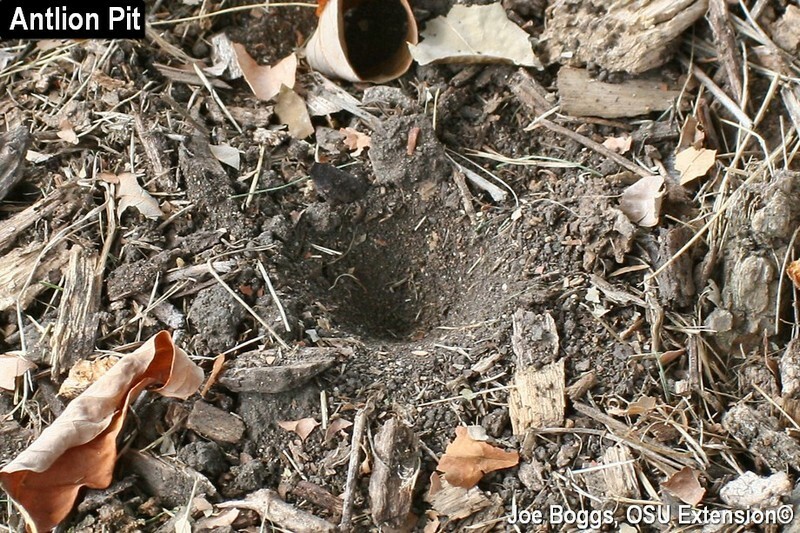 If an ant blunders into the pit-fall trap, the loose dry soil particles provide no traction for escape by the hapless victim. The antlion uses its sharp-pointed mandibles to seize its trapped prey and pierce the victim's body allowing the essence-of-insect to drain into the antlion's mouth. Their dinning menu includes their namesake prey as well as any other arthropod the antlion can skewer with its mandibles. Antlions have great edutainment value. When my kids were young, I held two antlions in a sand-based terrarium one summer; a kind of anti-ant farm. We spent hours watching them feast on ants dropped into the antlion paradise.